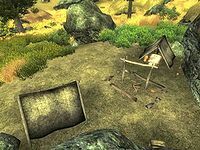 Bodean Camp is an empty campsite northwest of Kvatch (quest-related). The camp itself is not visible from afar, due to the landscape surroundings. The campsite consists of two small tents surrounding an unlit fire. The only items of interest here would be an easily picked locked chest containing minor loot located behind one of the tents, the flax plant, and the ginseng plant found nearby. Unless you have the official plug-in for the Orrery, no bandits will appear in this camp. This page was last modified on 5 December 2018, at 22:10.